What an incredible day! With beautiful weather and clear skies, we had a good feeling it would be a great day, but we couldn’t ask for more than the sightings we had today. 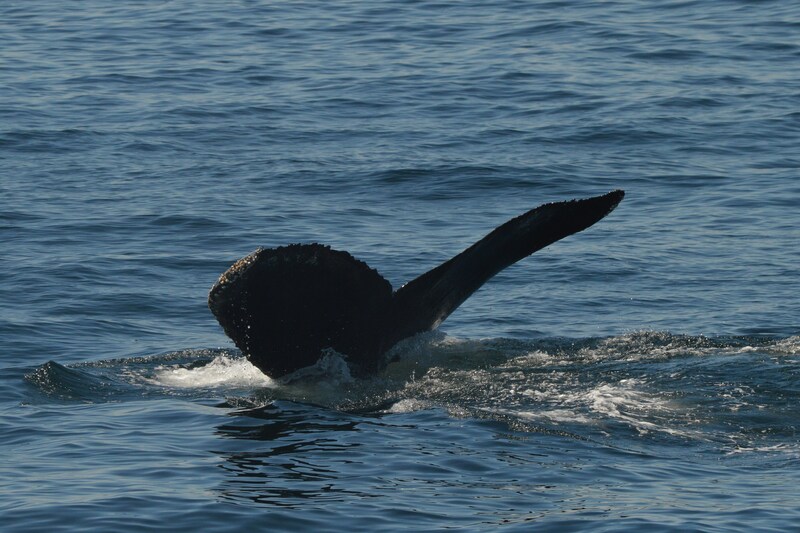 We began with humpbacks Dome and Rapier feeding. After watching these two whales (who were staying in the same general area as each other), we decided to continue on to see what else we could find. And wow! We could see whales breaching from miles away! 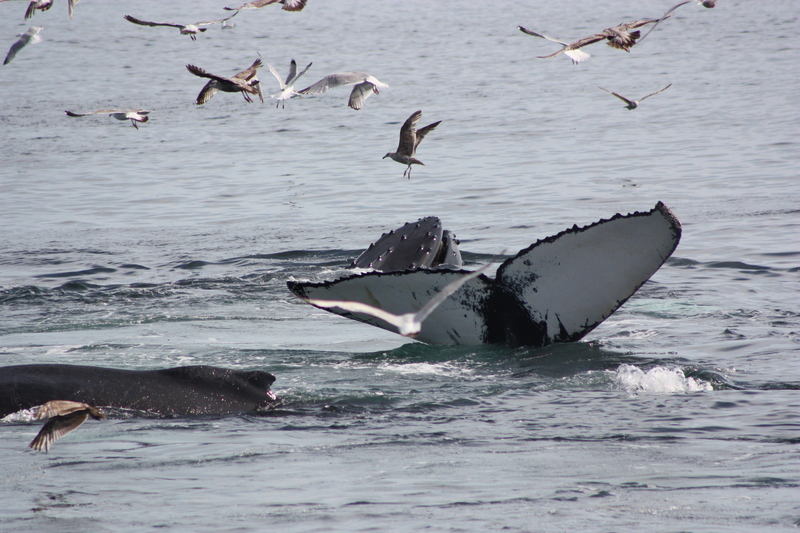 As we approached, we realized there was a large amount of humpbacks in one very concentrated area. Most of them were feeding, in fact almost all were kick feeding, which is when the whales slap their fluke on the surface to stun fish to feed on. 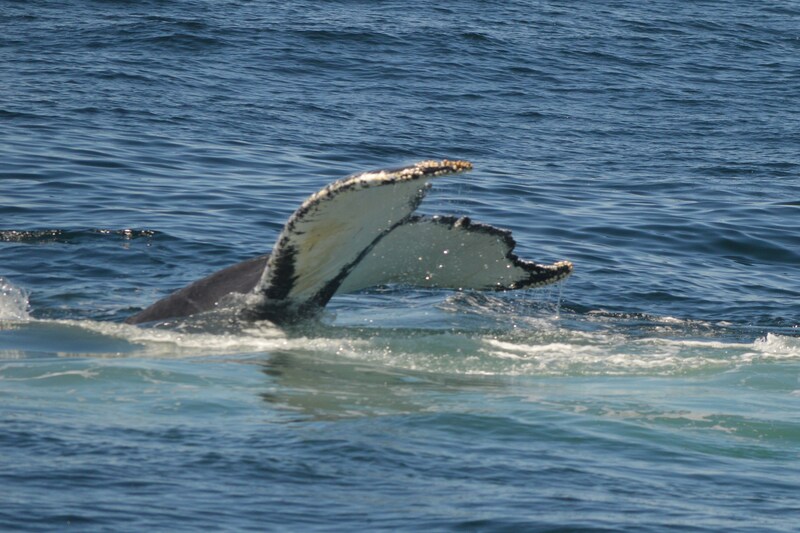 We must have seen 25 or more humpbacks, and had amazing looks at about 20!!! Below I will include the flukes we were able to photograph and identify- I will be looking at photos of dorsal fins and feeding whales this weekend to see if I can ID any other individuals. Just amazing! Humpback whale at the surface after feeding. 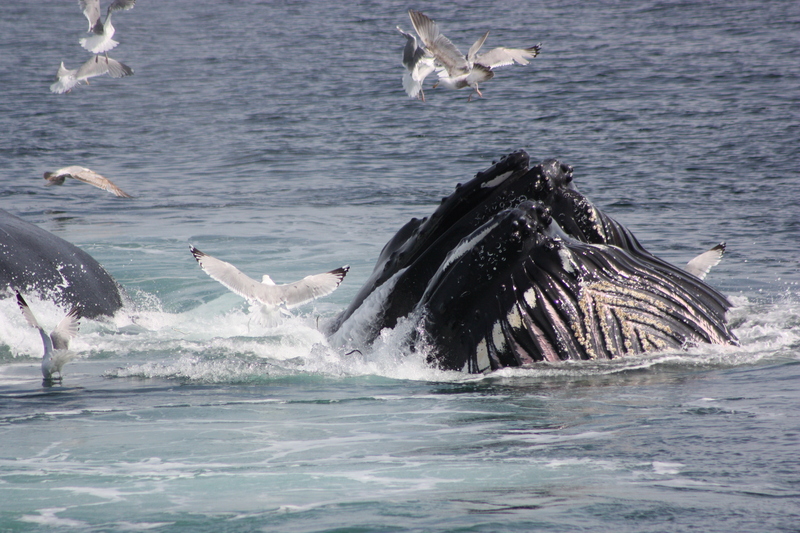 Humpback whale dragging- taking a huge mouthful of seawater and letting the water pour out the sides of the mouth. Posted on June 9, 2014 by The Whalemobile CommentsNo Comments on World Oceans Day! 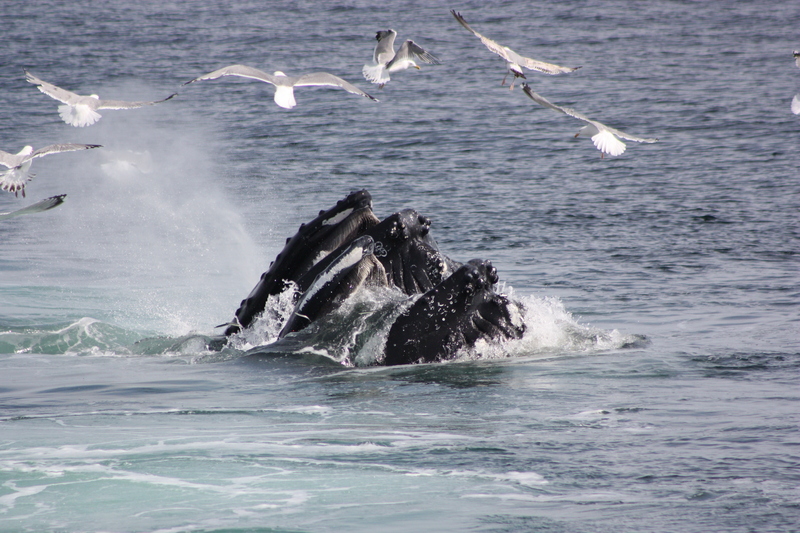 Feeding Humpbacks!!!! That sums up World Oceans Day! 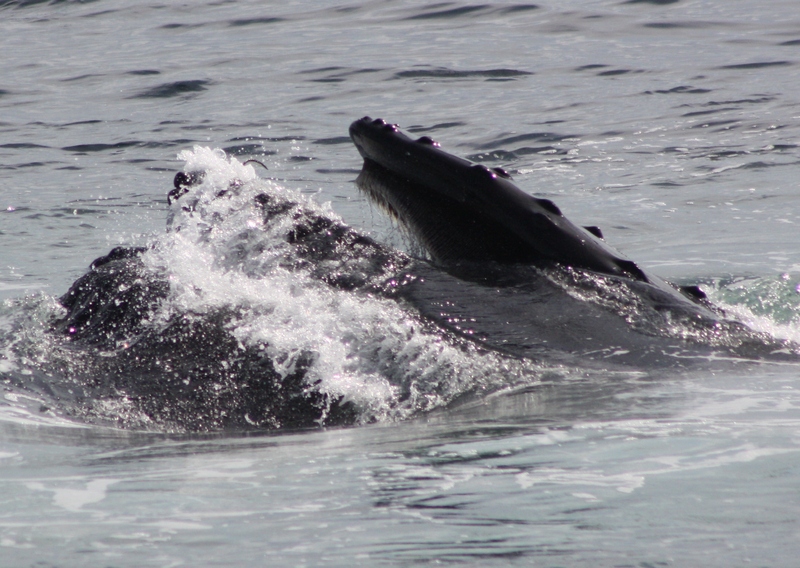 The humpbacks were celebrating sand eels today! At one point today, we were surrounded by 20 feeding whales! There was a group of 3 adults (Glostick, Jabiru, and Pleats) that were feeding together. Glostick was kick feeding and she did 5 kicks, getting bigger and bigger, blew bubbles and then all three whales would surface. After seeing that many times, they started lunge feeding. We would see the sand eels jump out of the water, followed quickly by a few bubbles and then three lunge feeding humpbacks!! Glostick is one of this year’s mom and her calf was just hanging out at the surface. He or she breached a few times and also did a few tail breaches. So exciting!! Another large group of whales was moving around feeding together. At some points, I think there were 7 whales in the group! Cajun, Geometry, Orbit, Pepper to name a few. It’s always amazing to see that many animals feeding together. 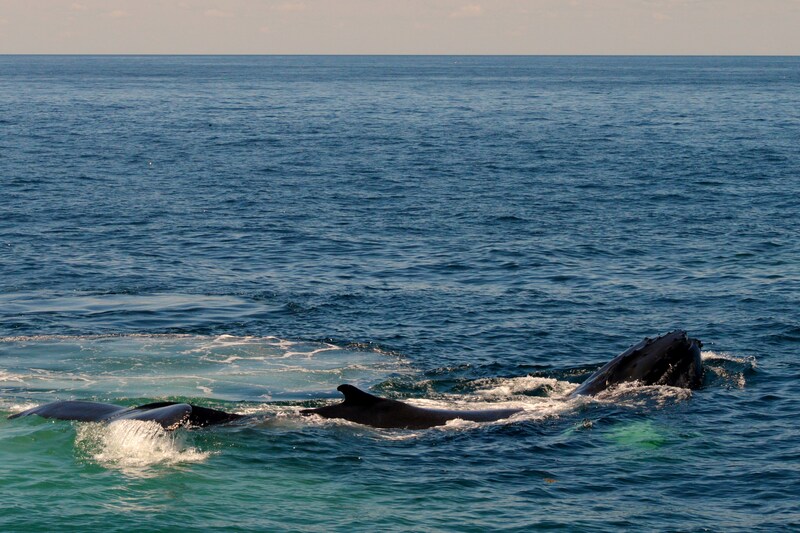 It’s so interesting that Cajun was in this group because a few years ago, there was a large group of humpbacks staying together, and again Cajun was part of the group–two years in a row. We also saw Dome kick feeding. Echo and her calf were also out there feeding as well. It was truly an amazing day! Flat calm, and lots of whales! Can’t wait until tomorrow!!! What a great day today! We had two completely different trips in the morning and afternoon, both with awesome sightings. The day started out with an amazing look at a fin whale. This whale was swimming very slowly and staying close to the surface for a long time, allowing us to be able to appreciate just how large they are! 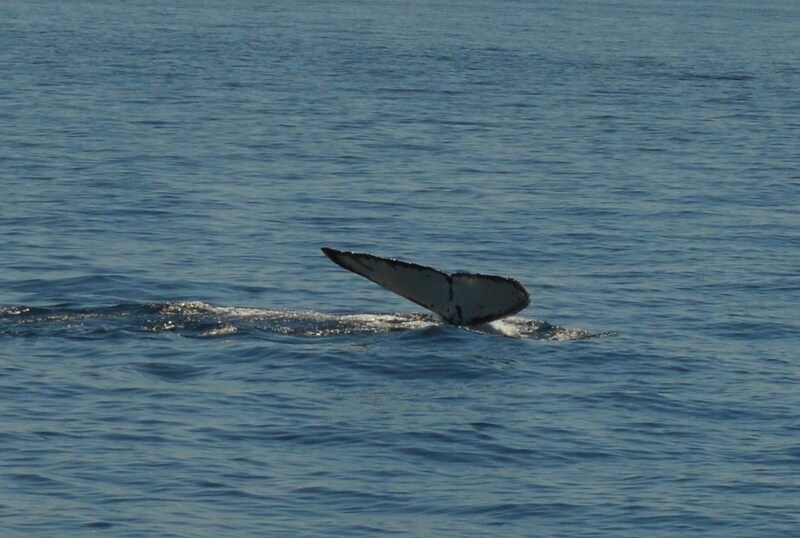 At one point, we could see almost the entire whale under the water, with an especially clear look at the fluke. 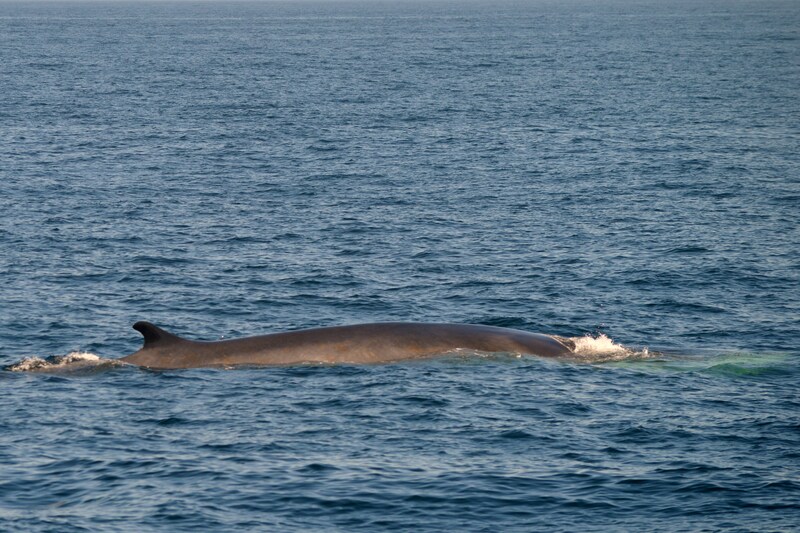 Fin whales have great coloring on the top of their bodies, and you can see the white color of the lower right jaw. From there, we noticed another whale nearby. 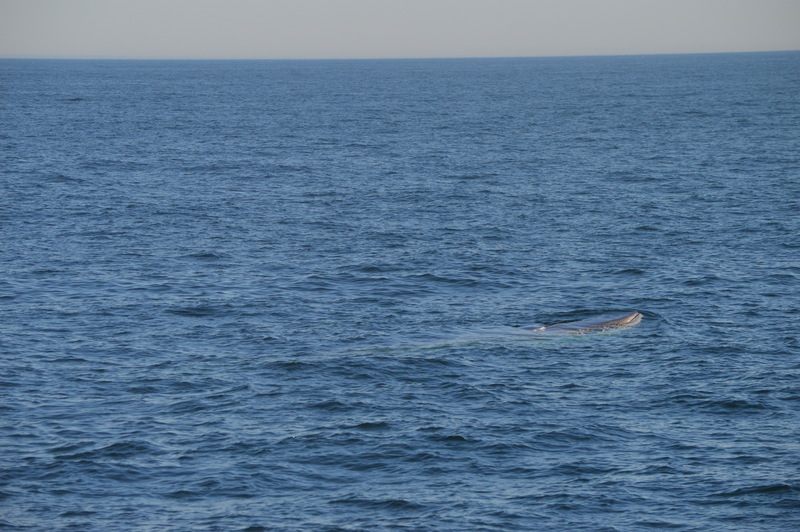 It looked like a minke whale, but it did not have a dorsal fin. 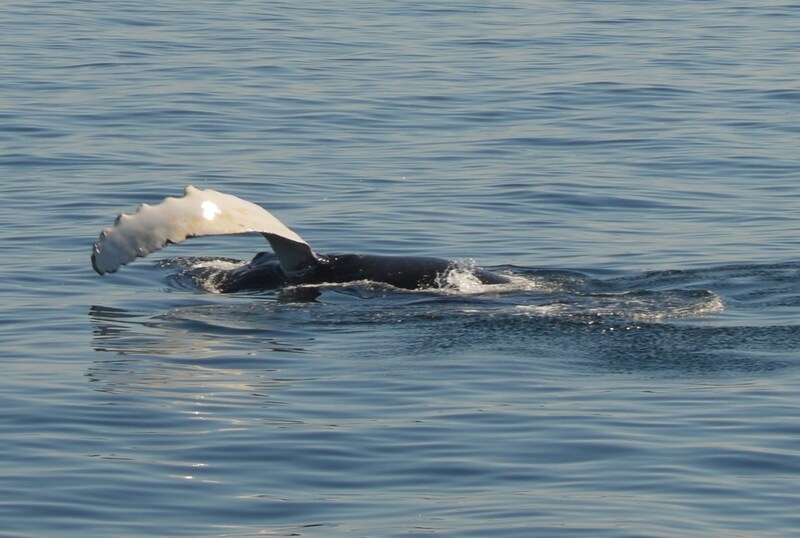 As we were able to take some closer looks, we realized that the whale had a huge white scar where the dorsal fin should have been, and also had propeller scars on its back. Unfortunately, it this whale is an example of a number of threats that whales face. 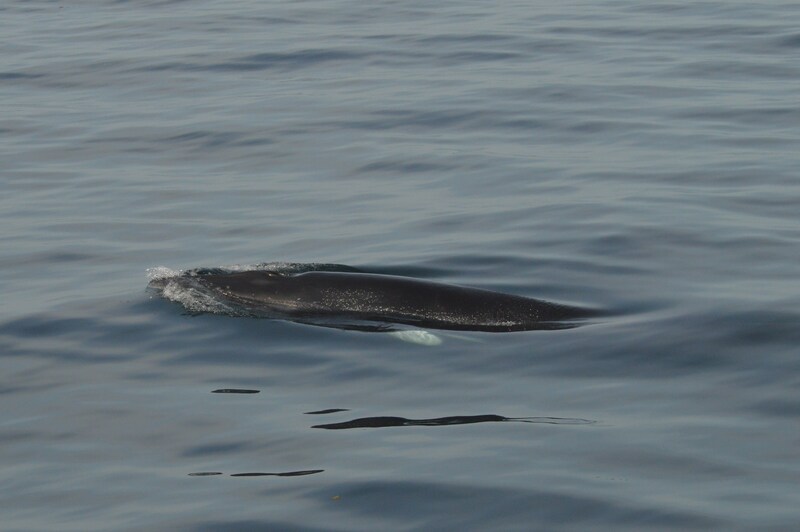 The scar looked to be old and healed over, and this minke was swimming quite quickly. 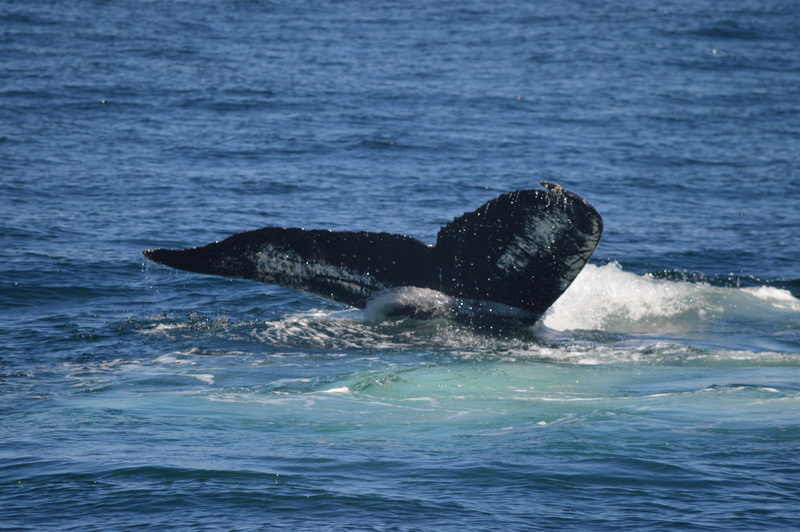 We then viewed our third species of the day, humpbacks! We started with Cardhu, a female well known to Stellwagen Bank, and also in the area was Mogul. Our first sighting of Mogul this season! 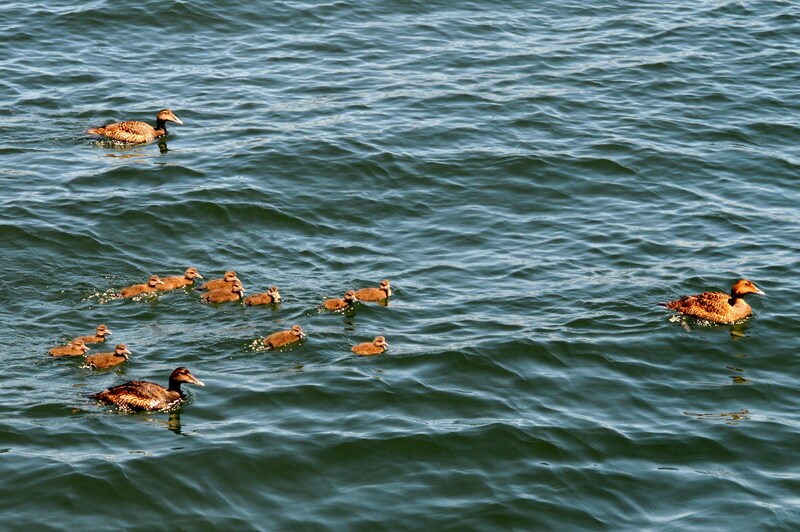 We spotted the family of eider ducks living in Gloucester Harbor on our way back to the dock. 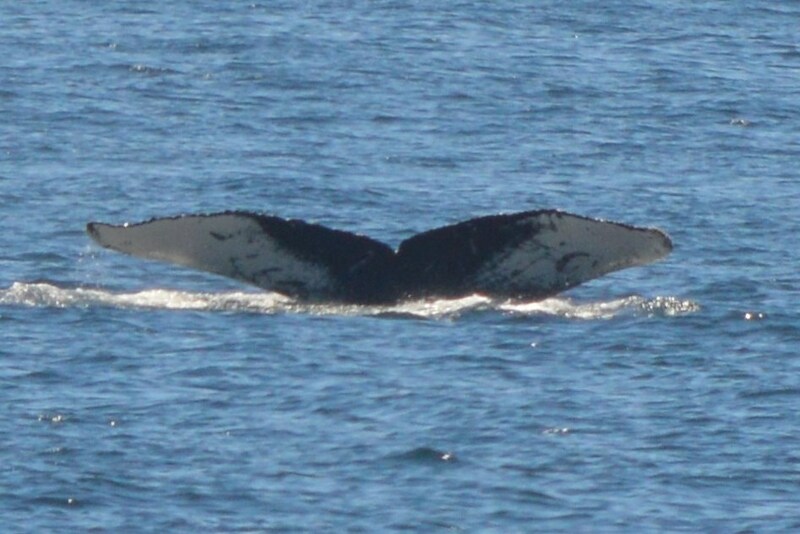 The first whale we watched on our afternoon trip was Amulet, and then Measles, two humpbacks that have been spending a lot of time in the area lately. We also saw a number of seals in the area. With a lot of bird activity as well, we could see evidence of a large amount of bait fish in the area. It is clear why Measles has its name! A grey seal taking in the day. 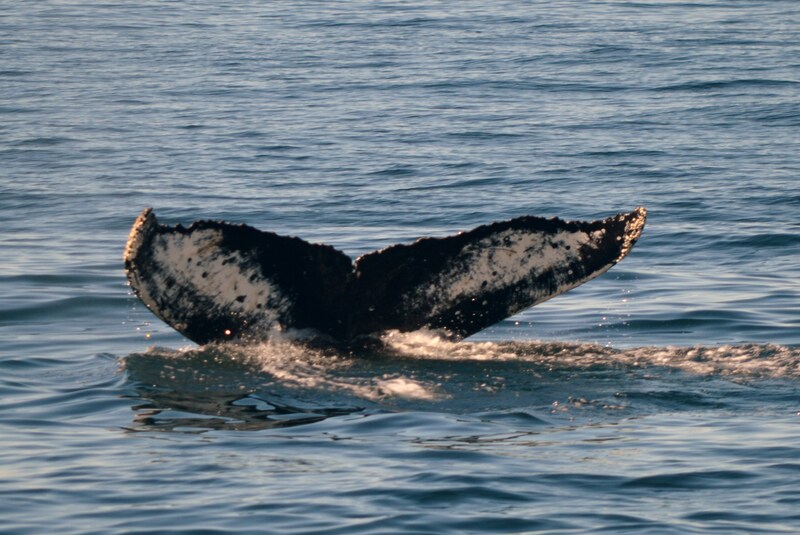 In addition to Amulet and Measles, we also watched an association between two whales. 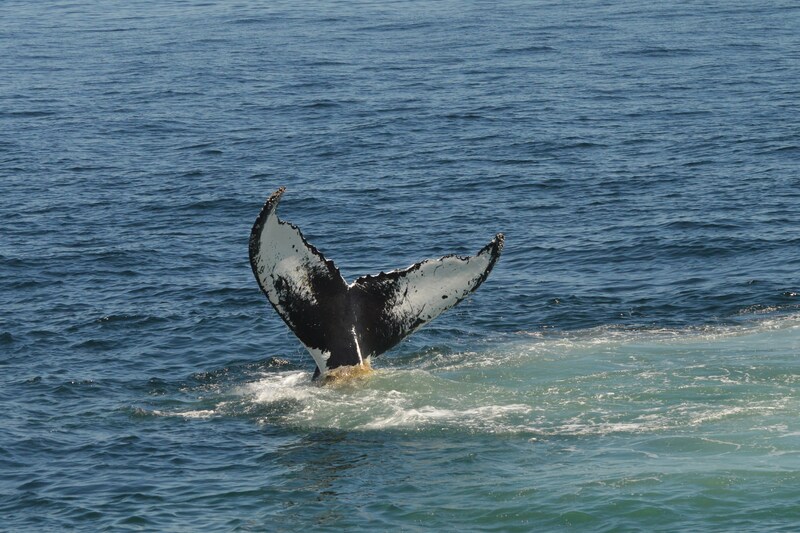 One was easily identified as Pleats, as she is another whale with propeller scars. 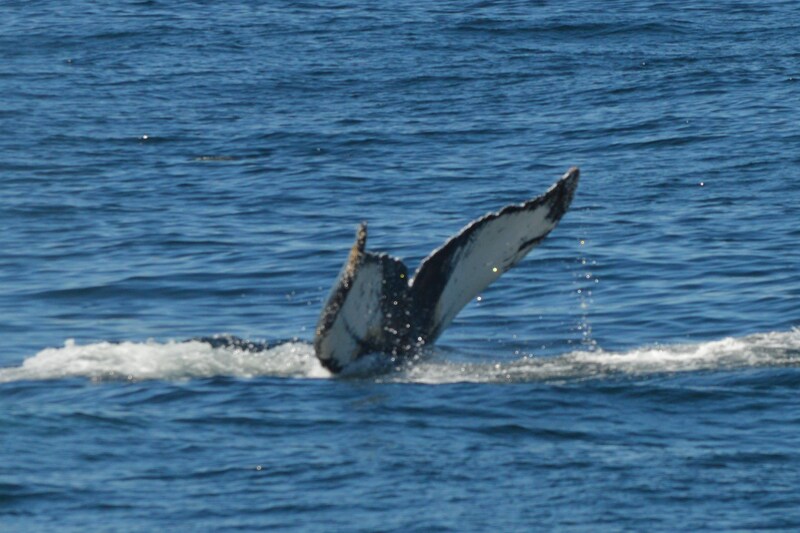 It is unfortunate to have seen two whales that have sustained these kind of injuries but it allows us to talk about the challenges marine animals face. Pleats and the other whale went for a dive and we were wondering where they might be, when suddenly Pleats appeared in front of us flipper slapping! The scarring on Pleats’ back is best viewed from the right side, but also noticeable from this angle. 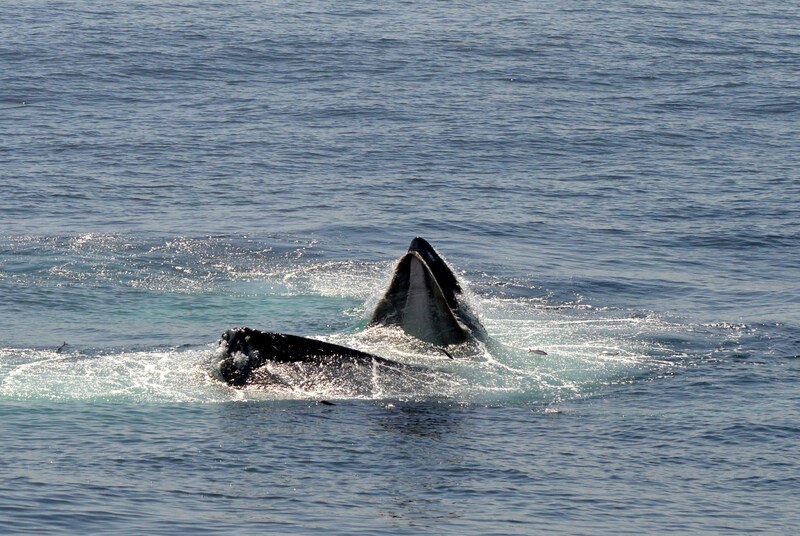 Shortly after this surface activity, the association ended and the two whales swam on their own. 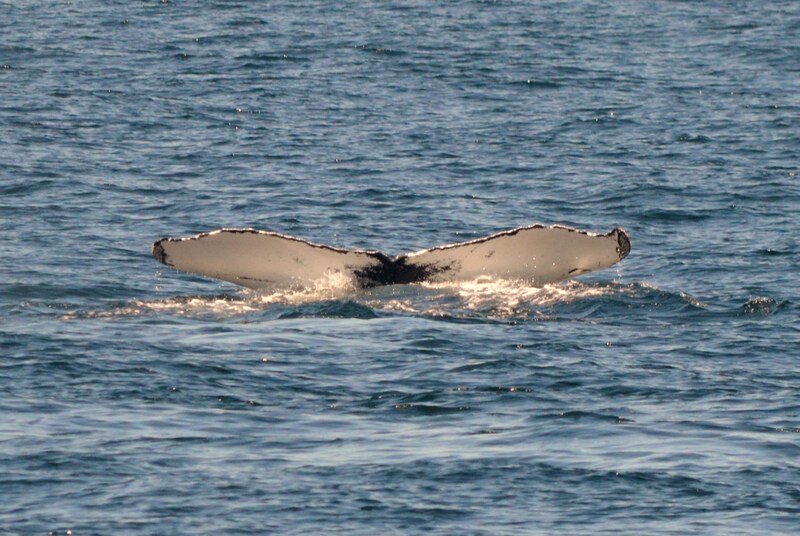 We were really hoping to get a look at the other whale’s fluke to ID it, but it did not fluke up at all! 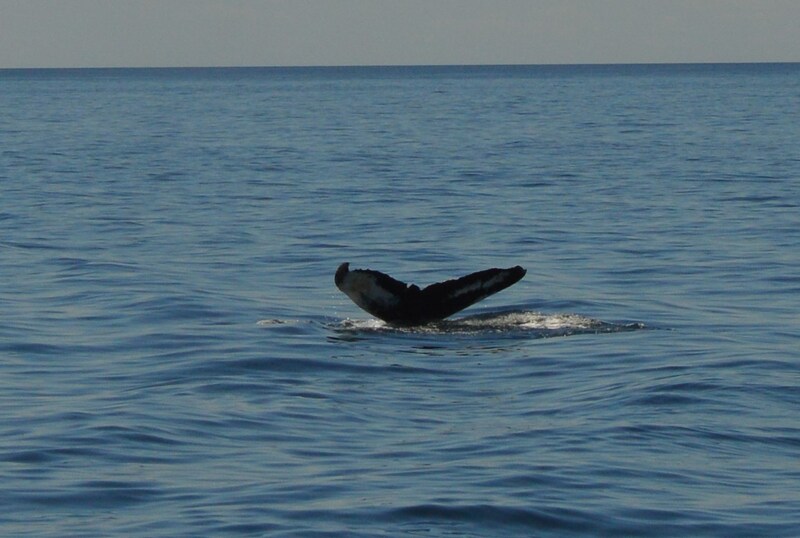 Our only shot was when the two whales were swimming parallel to the boat, and we got a tiny glimpse of one side. By looking at the marking at the top, as well as another photo of the whale’s dorsal fin, we were able to ID this whale as Jabiru! 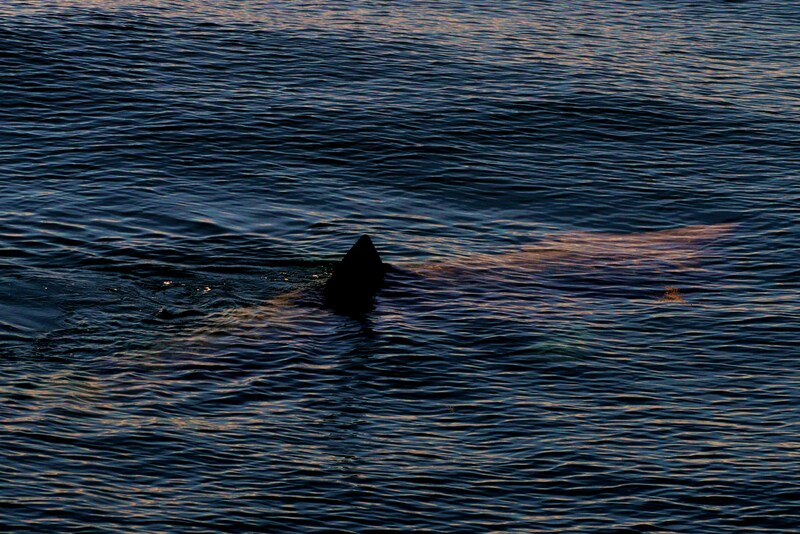 On the way back to the harbor, we also stopped briefly to take a quick glimpse of a basking shark. Awesome day! Sometimes we don’t have a lot to work with when identifying whales. 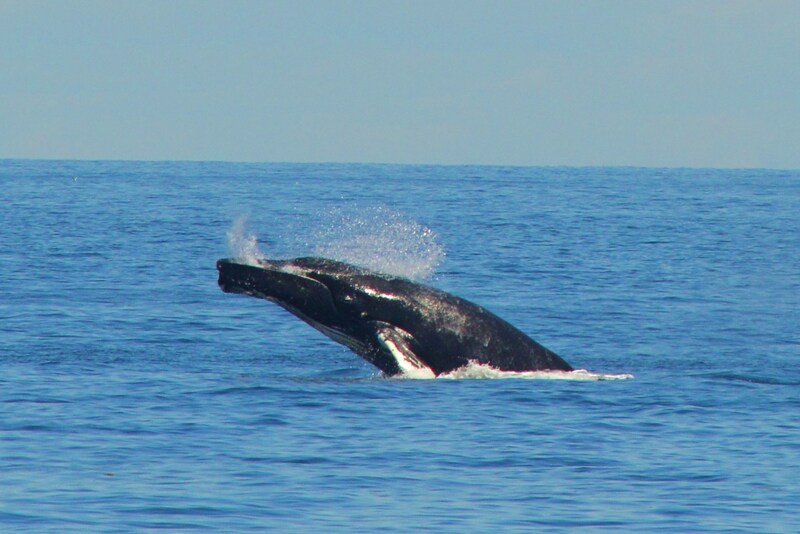 We traveled east of Stellwagen Bank to Tillies Bank and had some great sightings! 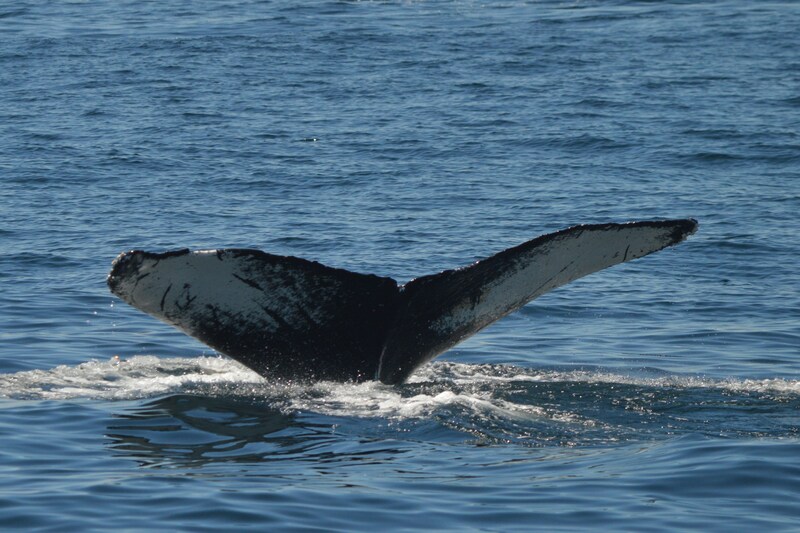 Our sightings have been fantastic lately, with up to about 15 whales in one area. As we traveled east, there were many patches of bait fish swimming at the surface. This is a neat thing to see, but it made me hopeful for seeing open mouth feeding. We were not disappointed! We found a humpback whale (Hancock) and were quickly treated to amazing looks as he fed repeatedly on the large amount of mackerel in the area. We noticed that the bubble nets he created were near the edge of the schools, rather than right in the middle. At first thought, you might wonder why he wouldn’t swim right in the middle of the fish, but many of these types of behaviors are very calculated. We were thinking that he was trying not to create gaps and break the fish up into smaller groups. Fascinating to think of how much careful planning and thinking goes on with these whales every day! First of three in one series of open mouth feeding photos! 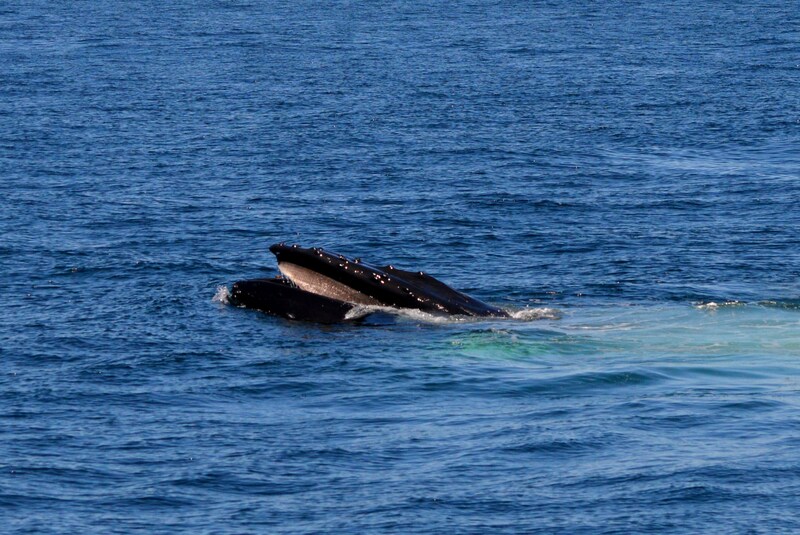 In addition to Hancock, there was also another humpback in the area. 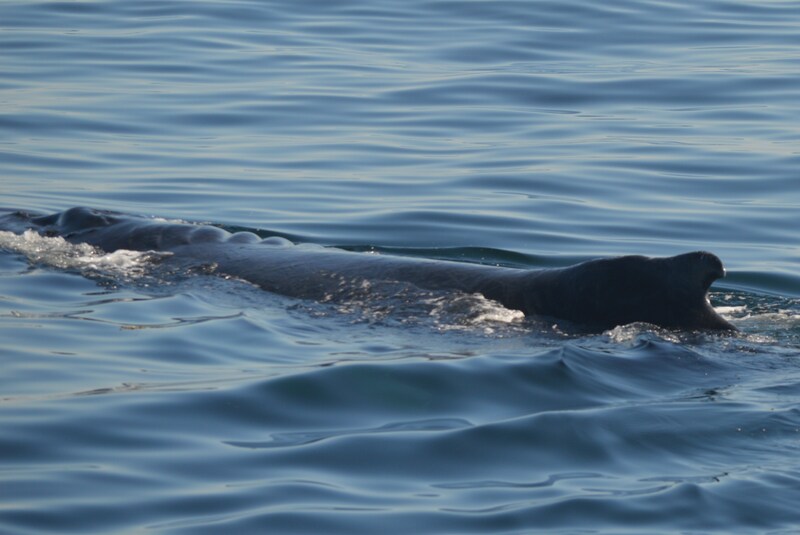 This whale did not fluke up, so we haven’t been able to identify it. It was traveling a bit faster and surfacing far, so we stayed near a spot which left us surrounded by fin whales and minke whales! 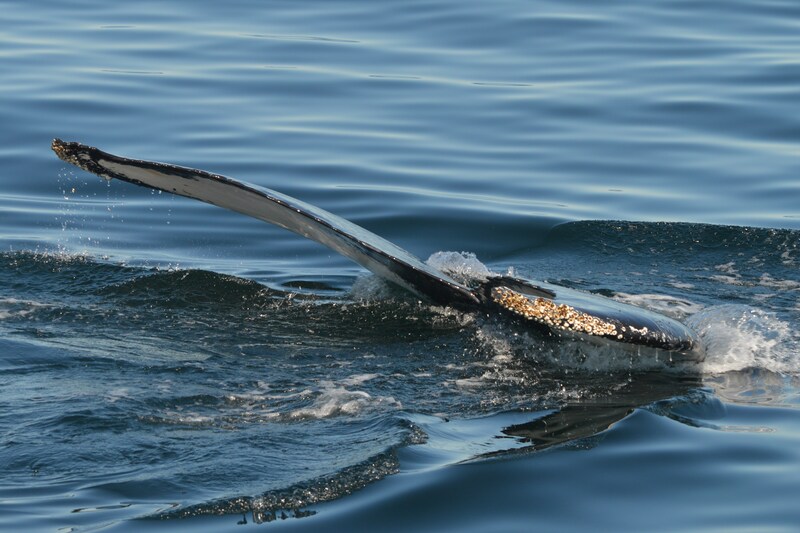 We actually watched a fin whale lunge feed- fin whales use baleen in the same way that humpbacks do, however they do not create bubbles nets or bubble clouds. As we were watching the fin whales, a minke passed by very close to the boat. It swam along the starboard side, dove under for a moment, and slowly passed right next to the port side. We had a great look as it made its way toward a patch of bait. A great look at a minke whale, including the ‘minke mittens’- minke pectoral fins are quite a bit smaller than a humpback’s! We were already feeling spoiled with a great trip when we spotted not one, but two basking sharks on the way home! With the glass calm water we had super looks. Even after seeing all of the large whales, these sharks looked enormous! They were probably close to 25 feet long. We have been especially lucky early in the 2014 season, we really have enjoyed every trip!